Good Afternoon, readers of the blog! It's Friday... but I feel like it's the middle of the week... I have finished several large pieces this week and have a few announcements, so I'm popping into my blog to let you know the news! First off, locally, I have art work featured over at First Edition Cafe and Espresso Bar here in Downtown OKC. First Edition lies adjacent to the downtown Library and has great coffee, healthy smoothies, and brunch items, and they are super-friendly to our local art scene and creative downtown programming. I have some selections from my Women and Wanderlust series, and some whimsical birds and buggies, and a few small Dia de los Muertos pieces for fall on display priced for every budget. The work will be up for at least the next month and possibly longer- I hope you'll check them out. click on the pic to go to the link where you can bid... if you wish to participate! Also, a week ago I was contacted by a herpetology rescue group- if you don't know what kind of animal lover I am this is the point where someone is supposed to be shouting "spoiler alert!" really loudly. After working with Sit.Stay.Art! for 2 years as participant and volunteer, I have enjoyed making art for this kind of cause- the Help-A-Herp Society is essentially seeking the same thing to fill their areas of hardship when someone abandons a snake or large reptile they cannot take responsibility for- feeders, homes, humidifiers, all those things that go into housing and caring for this kind of pet need to be provided when you rescue a King Snake or Bearded Dragon. 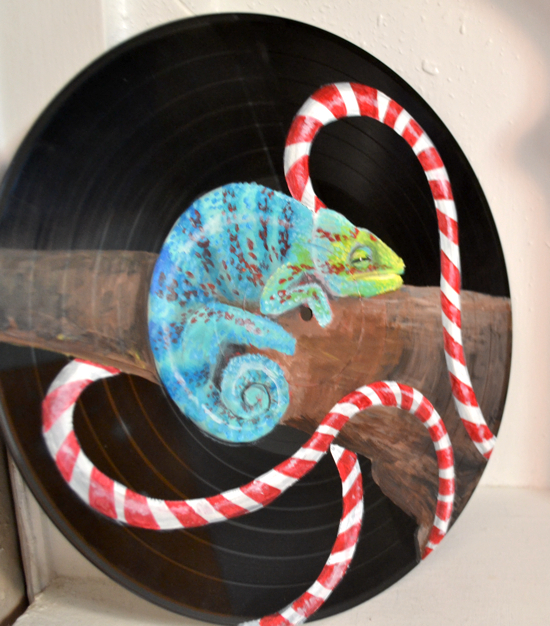 I have donated my chameleon record painting to one of their FB auctions and the proceeds of the Sale will go to help provide supplies for fosters and rescued "herps"... If you want to take part or find out more info the Help-A-Herp group is located here.